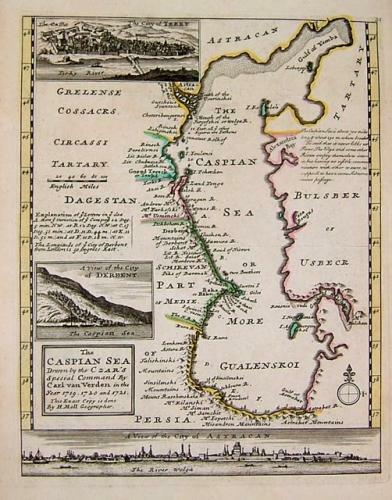 Title: 'The Caspian Sea. Drawn by the Czar's Special Command by Carl van Verden in the year 1719, 1720 and 1721. This exact copy is done by H. Moll Geographer. (with view) The Castle, the City of Terky. (with) A view of the City of Derbent. (with) A view of the City of Astracan. (Printed and sold by T. Bowles next ye Chapter House in St. Pauls Church yard, & I. Bowles at ye Black Horse in Cornhill..). From Atals Minor. Hand coloured engraved map with 3 views. Relief shown pictorially. Includes geographical notes.